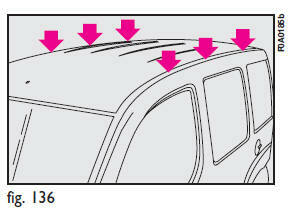 To use the roof racks you shall remove the caps set in points fig. 136. Attach the roof rack bar brackets to the fasteners. Always follow the instructions provided with the kit carefully. The bars should be fitted by skilled personnel. After traveling a few kilometers, check that the attachment fastening screws are tight. Distribute the load evenly and when driving, bear in mind the increased sensitivity of the vehicle to side wind. permissible loads (see section “Technical specifications”). Strictly comply with current law regulations concerning max. overall dimensions.